Alan Glen is a singer-songwriter from Canada. He spent over ten years touring Canada and Europe with his independent band before relocating to Berlin. Since then he has been dividing his time between music and the comedy theatre group Laugh Olympics. 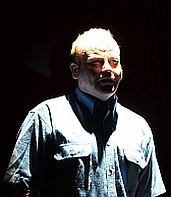 Blue Vein is his debut in the theatre as a solo performer. Fingal Pollock has now been in Berlin for over one year. She came here after spending 18 months studying theatre with a small company of actors in rural India. In Berlin, she has worked with Laugh Olympics, Platypus Theatre, Three of Cups Productions, Galli Theater, Be Berliner, and the TUSCH in Schools project (not to mention some healthy clowning on the side!). She directed a successful run of Blue Vein in New Zealand, but when she met Alan Glen, she knew that she could not deprive the Berlin audience, and herself, of the opportunity of watching him bring this script once again to life. Duncan Sarkies is a playwright, screen writer, fiction writer and stand-up comic. All of his work is characterized by an eccentric, bizarre and poignant black humour, which can leave the audience wondering whether the author is laughing with them or at them. Sarkies likes to show the ways in which all of us are, if not quite mad, then at least partly unhinged.